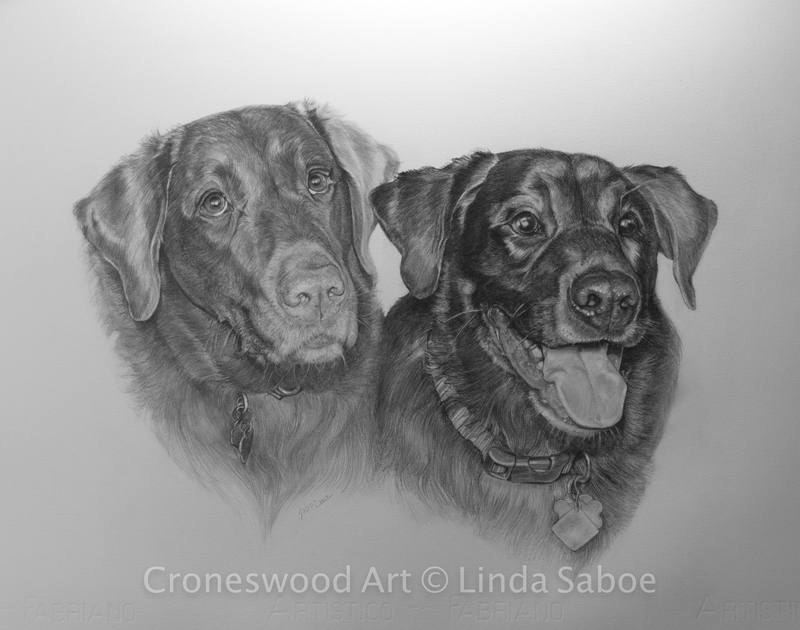 An old internet friend commissioned me to do a double portrait of his sweet dogs, who have sadly passed on. Rooney, a chocolate lab and Magic, a black lab were my subjects. I’d never met the dogs, so only had pictures and my friend’s description of what the boys were like. It is a funny thing but as I draw, I feel like I’m actually getting to know who or what ever I’m drawing (yes, if I draw a rock, I start to feel I know the rock) and it was the same with these two. Rooney seems such a hopeful, serious sort and Magic goofy and playful. Both seemed open and loving and most of all, loved. So, here’s Rooney & Magic, approximately 16×20 in graphite. It was great getting to know you. Rooney & Magic, 16×20, graphite. There is this awesome place in Utah that I hope to visit before I die. It’s the Tracy Aviary in Salt Lake City. They have a FB page where they post wonderful photos of their birds. 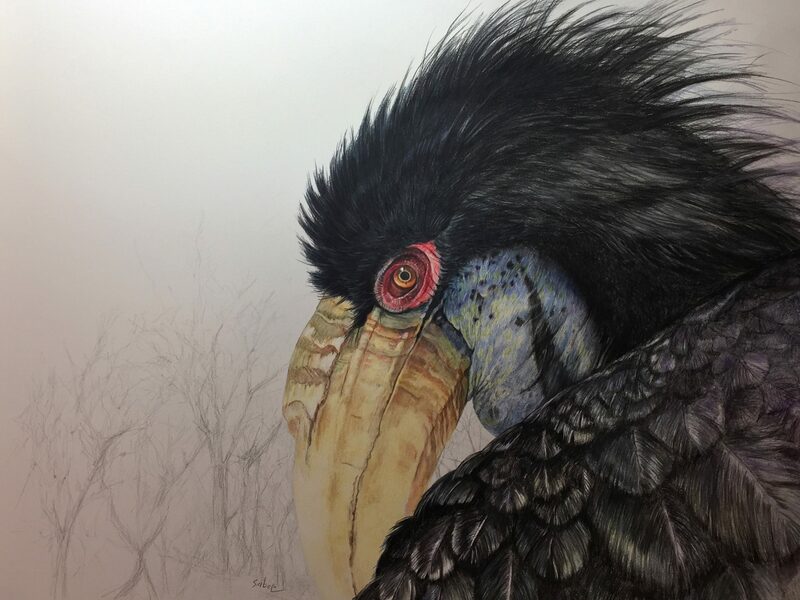 I saw a photo they posted of their Wreathed Hornbill (Rhyticeros undulatus), Zelda. I fell in love with her and wanted to draw her very badly. I requested permission to use their photograph as a reference and they granted it. So without further ado, here’s Zelda. Zelda. 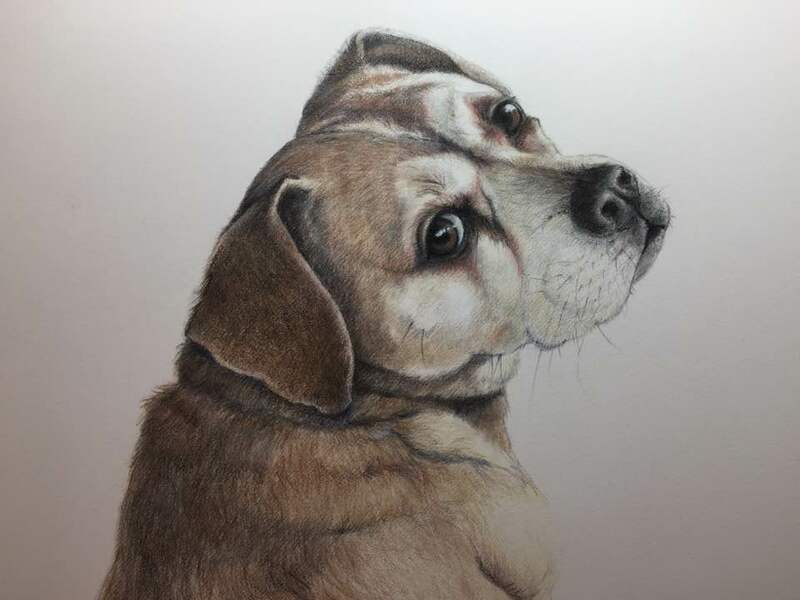 Colored pencil, appx 14″x17″. Reference with permission of Tracy Aviary. I think she’s the most difficult bird I’ve attempted so far. I hope I did her justice. 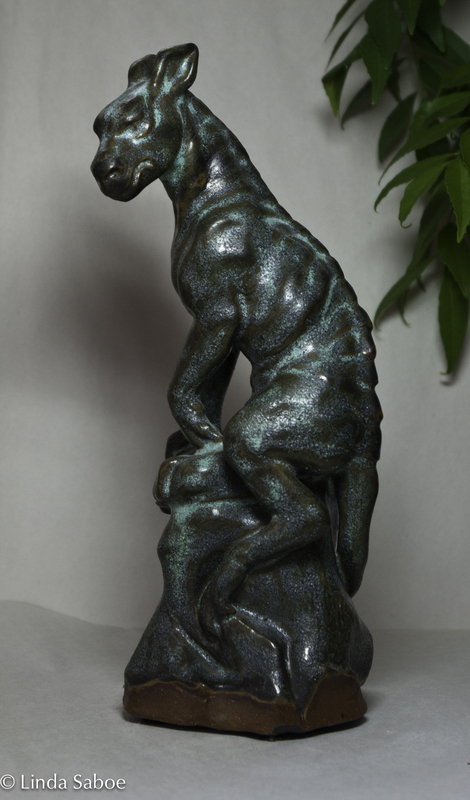 My little dog gargoyle was in a show recently at the JAM Gallery in Malvern. This little boy has been yearning for a forever home and he found one. Thanks JAM for the sale! Many decades ago, I bought a set of pastels at a fire sale. It was a real fire at a local store where I lived at the time. The owners sold everything in stock that was not too badly damaged. Mostly, things just smelled of smoke. I scooped up a 90 color set of Rembrandt soft pastels for a song (no dance). I recently looked up the going price for the set in today’s market and it was something over $300. Anyway, I did of few pictures with them, teaching myself as I went along and they were okay. And then my mom died, life got way busier shuffling home, work, kids, 2 jobs, and all the rest that goes with being a single mom with no money. There was really no room (or time) for art. I did a few pastels now and then for friends but nothing worth noting. So now with my kinda-sorta project of producing works on paper of animals that are endangered, maligned, or misunderstood, I thought I’d break out the pastels and see if I remembered how to make them work. Here’s the test, on a baby robin that I snapped a picture of while he was perching on the cable wire outside my window. Even though his mom was still feeding him, he felt quite proud of himself and his new found freedom. I have an online friend who is an amazing artist, sculptor, and photographer. Her wildlife photography brings me to tears (literally) with it’s beauty and sensitivity. Recently, I asked if she’d allow me to use some of her photos as art reference for my work and she said yes. 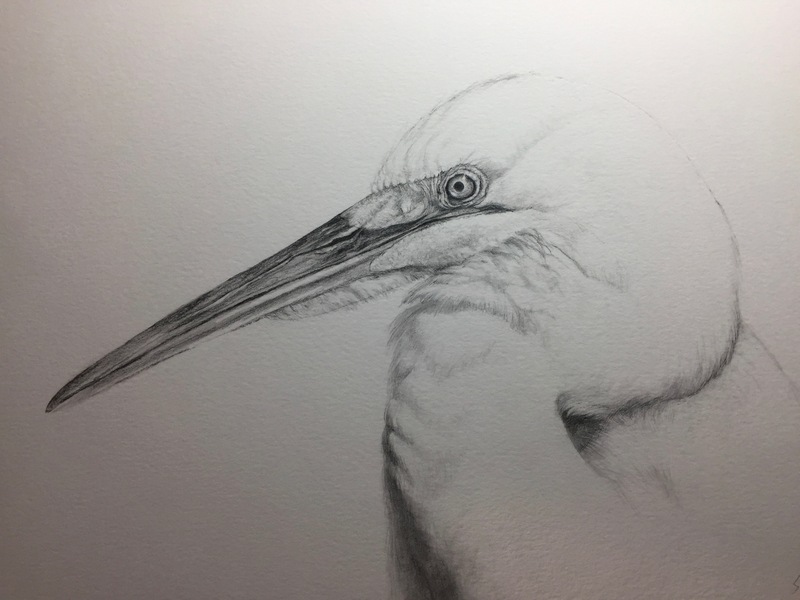 When I saw her photograph of an egret, I wanted to do a minimalist, “white on white” drawing. Not sure if I pulled it off to my satisfaction but I think it’s okay for a first attempt. Great Egret by Linda Saboe. Graphite, 9×12″ reference photo by Pat Lillich. It’s been a while since I posted anything here. This is a hard one because my heart is broken. My dear, sweet Loki passed away on Nov. 17, 2016. She was just shy of 16 and the light of our lives from the day we rescued her from a (then) kill shelter at around 6 months old. This month, I was able to finally sit down, go through the many hundreds (maybe closer to a thousand?) photos of her for a portrait. I settled on a photo that I’d taken of her in Feb. 2016. So through my tears, here’s my sweet girl. 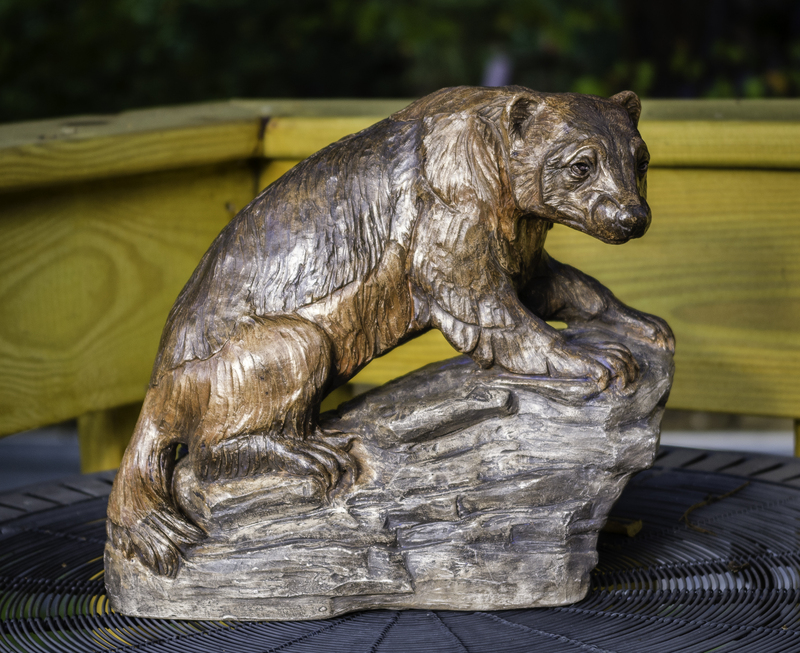 The Wolverine, Gulo gulo, lives in the most severe climate in the far reaches of the northern hemisphere. The largest member of the weasel family, looking more like a bear than a weasel, she lives a mostly solitary life. 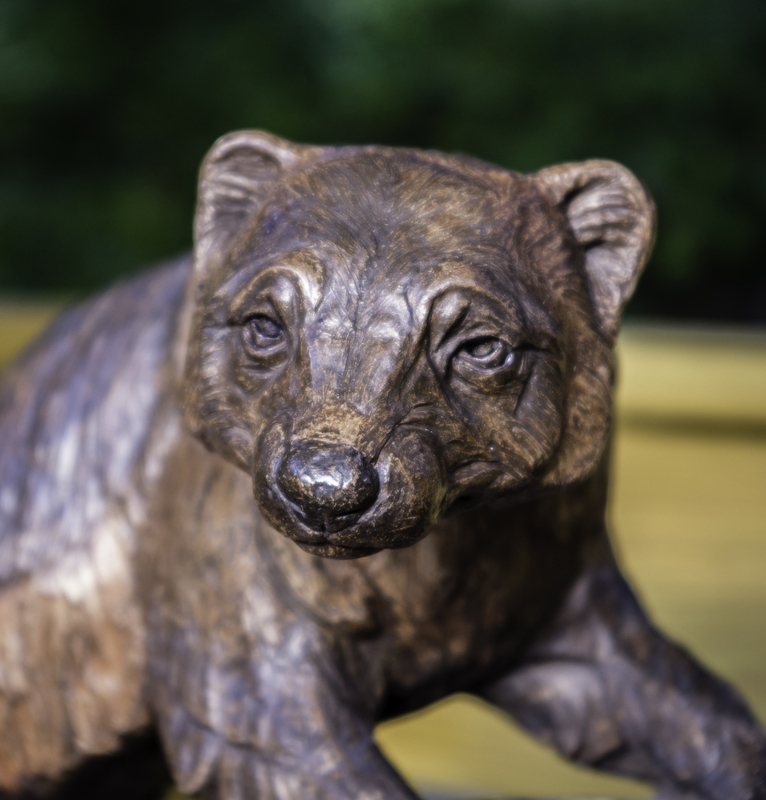 Fierce, stocky and strong, she can bring down prey much larger than herself but due to the harsh climate, the wolverine will partake of most anything she can come by from Elk to rabbits, mice, carrion, roots and berries. Of course, this makes her terribly misunderstood and maligned as noted by the name we’ve given her: Gulo, latin for glutton. 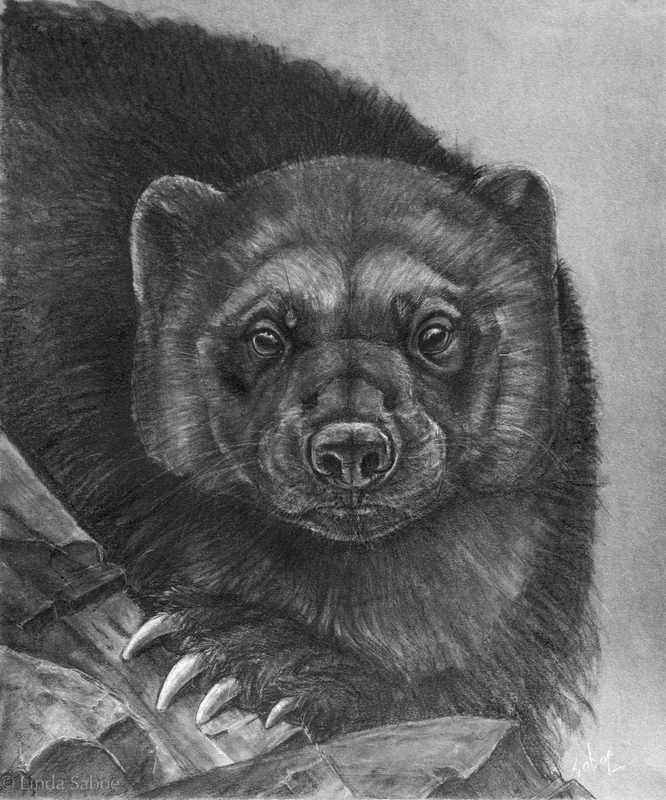 Wolverines need a large territory in which to hunt and mate and are not willing to share with others. A lucky male will usually form lifelong bonds with a few females, whom he will visit from time to time, mating and hanging out with the young until they are weaned. Sometimes the young will go traveling with Dad when they get older until they settle in their own territories. Highly endangered through hunting, trapping, climate change and shrinking habitat, the numbers worldwide are not known but according to Defenders of Wildlife there are approximately 250-300 individuals in the contiguous United States. I’ve been fascinated by this animal for many years though I’ve not attempted to draw, paint or sculpt her until recently. This newest sculpture took me a long time but then it takes time to get to know this beautiful, misunderstood creature. Here’s a closeup of the face. Everything about the Wolverine is sort of solid and square. Here also, the charcoal drawing I did a while ago. Woverine Watches by Linda Saboe. Charcoal, 12″x14″. Resource photos: Dreamstime/Dennis Jacobsen and Dreamstime/Vladislav Jirousek.